Which attachment, paddle or whisk, is used to beat the egg and sugar mixture? Hi! I just use the paddle attachment. Hope that helps! Just made these incredible lil morsels of heaven! They’re perfect! 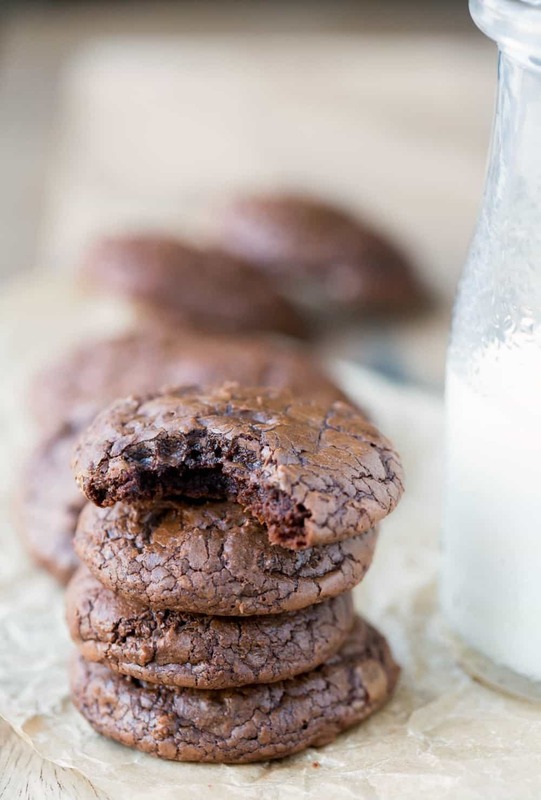 Brownie in cookie form, best of both worlds. 8 minutes is just enough time to ensure gray chewy delightfulness. I’m goin freeze half the batch to see how they hold up. Fingers crossed, they’ll be just as delectable once frozen. These cookies are amazing!! I left out the nuts because I’m personally not a fan of nuts in my brownies. I also left the batter in the fridge for almost 5 hours, took it out, had to microwave to thaw a bit and they still turned out great! Thank you so much!! I’m glad to hear that they came out well for you. =) Thank you for coming back to comment! Hey,can I make brownie of this batter? Hi! I haven’t tried to bake this batter as a pan of brownies. I’ve made it in a muffin tin, and it worked well, but I haven’t tried it to say for sure. Delicious, I make these for the holidays and the entire family loves them. Yay! I’m glad that everyone liked them! =) Thank you for coming back to comment. Love them. 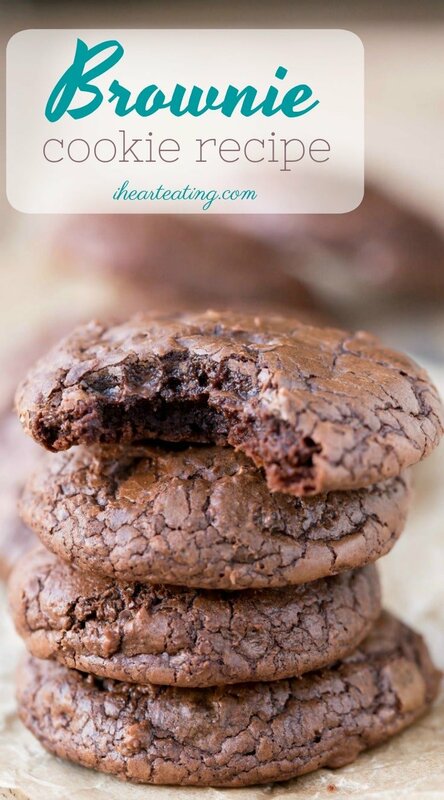 I will make them multiple times this holiday season! Way better than I imagined. I followed the recipe to a T except I also left them in for 15 min in my electric oven. My new go to easy yummy dessert! 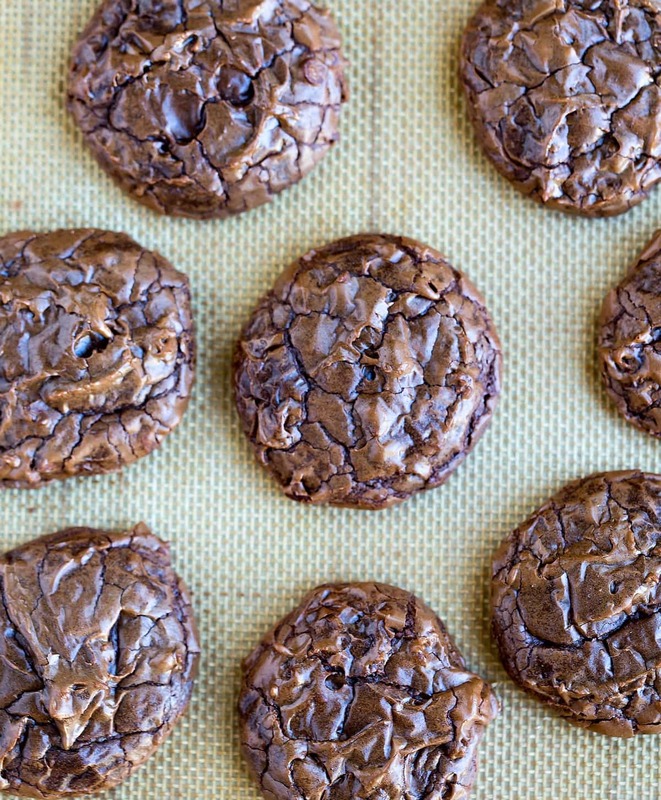 Can you freeze these cookies after you bake them? I’m afraid they would lose their “crackle”. I haven’t tried to freeze the cookies after baking them, so I’m afraid that I’m not sure on this one. Sorry! What should the consistency of the batter be ? Before of after you chill it? In step 6, it says that the batter should be the consistency of a thick brownie batter at that point. After you chill it, it should firm up a bit and be quite thick. Do you think the dough could be made into balls and frozen if I defrost before baking? I’m not sure. I haven’t tried to freeze this dough. If you try it, I’d love to hear how it comes out! Hello! 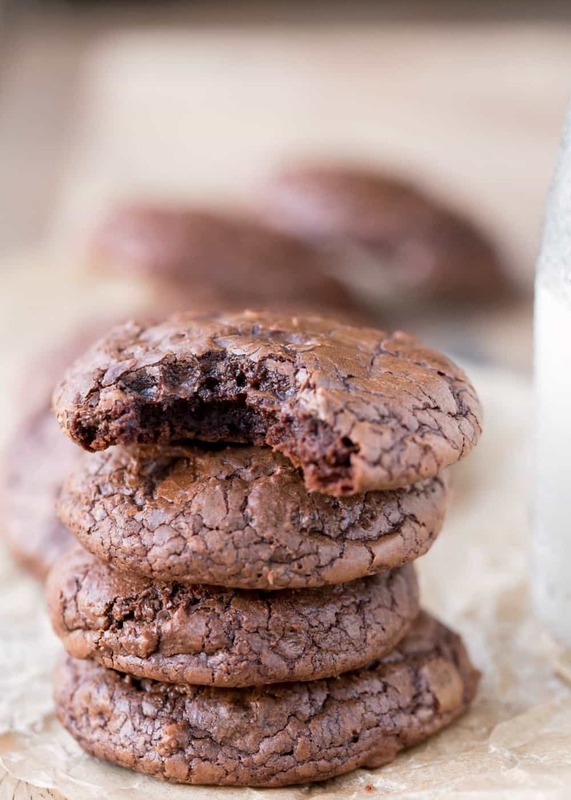 These look amazing!… might be a dumb question but can they be baked in a pan like actual brownies? Or is this strictly for cookies? Hi! Thank you! I’ve baked these cookies in a muffin tin, and they work well like that. However, I’ve never tried to bake them as brownies, so I’m not sure how they would come out that way. These are really good, but 8 to 10 minutes is not long enough for baking time, especially if you are using a gas oven. More like 15 minutes. Thanks for the note about gas ovens! I have an electric oven, so that’s what my timing is based on. Great recipe, huge hit at the dental office! I used a small cookie scoop so the cookies are less likely to broke when stacked in the cookie jar. Thank you! I’m so glad that they were a hit! =) Thank you for the tip, too! 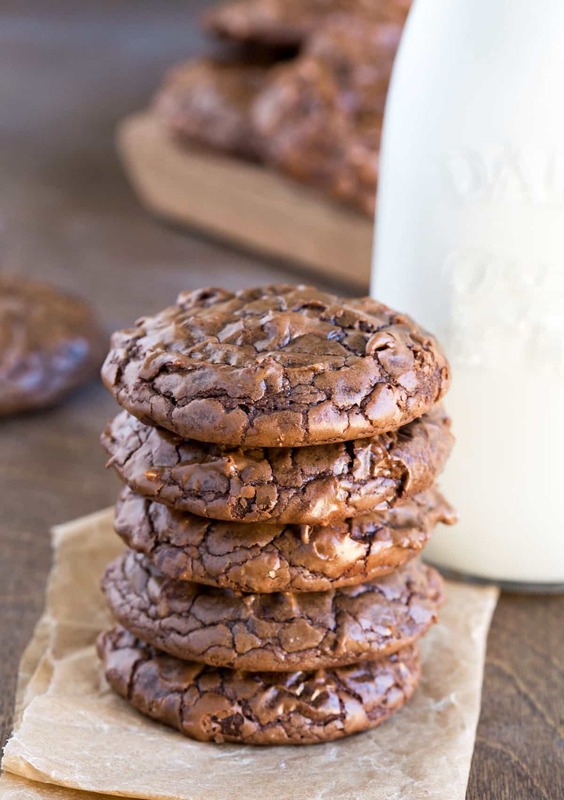 have you made these with Splenda? No, I’m sorry. I haven’t tried using Splenda in this recipe. Tried this recipe for something different than my usual chocolate chip. Crunchy on the outside and chewy inside, was perfect! Brought them into work and everyone loved them! New favorite cookie! Thank you so much! I’m so glad that you and your co-workers liked the cookies. =) Thanks for coming back to comment! I just finished these cookies! OMG they are so Delicious!!! I let them cool for 10 minutes and couldn’t resist trying one! They turned out perfect! I used the Dutch processed cocoa because that’s what I have in my pantry. Hello! I was thinking about baking these cookies to be wedding favors. Do you know if these cookies will freeze well after they’ve been baked? I’m sorry, but I haven’t tried to freeze them. I wish I had a better answer for you! Good luck! Thank you so much! I’m so glad that you like the cookies. =) Thanks for coming back to comment! Can I leave the batter in the fridge overnight to bake the next day? I’m not sure how it will work. The batter tends to set up more the longer that it’s in the fridge. If you wanted to leave it overnight, I think you would need to set the batter out before baking to let it soften up. Yes! Let’s figure this out. =) The first thing that I think of is that the egg may need to beaten longer. What did your dough look like? Was it thick like a thick brownie batter, or was it thinner like a cake batter?